Elizabethan tournaments were a great form of Elizabethan entertainment. Tournaments were enjoyed by both Commoners, Royalty and Nobles, the Upper Class and the Lower Classes. A rich member of the English aristocracy would sponsor a tournament and supply the purse for the prizes. A Elizabethan Tournament was a series of mounted and armoured combats, fought as contests, in which a number of combatants compete and the one that prevails through the final round or that finishes with the best record is declared the winner and is awarded the prize. Tournaments were imported from France during the 12th century and formed an important element of Elizabethan military and social life. The contests in the tournament were fought with blunted swords or lances. However there were still many casualties, as many as 10% were injured, and there were also fatalities. The number of fatalities dropped as the tournaments became better regulated. Elizabethan physicians were always at hand during the tournaments. Knights would fight as individuals but there would also be team events. There were many different types of Elizabethan Tournaments which each had a different type of combat method. 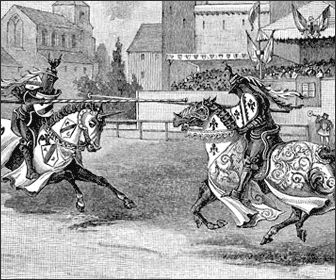 The events of the tournament were the joust, the melee, and fighting on foot. The Tournaments were the favorite sport of Elizabethan Knights. The tournaments kept the knight in excellent condition for the role he might need to play during warfare. There were different types of Elizabethan Tournaments, joust or melees, which each had a different type of combat method. No pointed weapons should be used - they should be blunted. And that tournaments had to be properly organised and only authorised combatants were allowed to carry arms. The Elizabethan Tournaments lasted over several days. As the tournaments became more organised, so did the event itself. The location of the tournament would be allocated by the sponsor. The sponsor was often a rich noble who would finance the prize. The tournament would therefore be located on a field near to the noble's castle and local village. The Lists were the designated area for jousting fenced off in the centre of the field. Wooden bench seats were sometimes erected but usually villagers sat on the ground in view of the lists. The Nobles sat in the galleries - pavilions erected to provide shelter. The whole area would be blazoned with color. The tents and blazons of the Knights. Even the horses were draped in flowing cloth, called a caparison, which was patterned according to its owner's heraldic signs. Elizabethan Tournaments - The Ladies Favours, Courtly Love and the Chivalric Code. Elizabethan tournaments were governed by pomp, ceremony and chivalric conduct. Ladies attended Elizabethan tournaments. Watching the exploits of the men during the day and attending the feasts and banquets in the evening. The rise of the ideals of courtly love was dominated by the concept that that honor should be done to a lady by her champion. The Rules of Courtly Love allowed a Knight to express his admiration even for married ladies. Knights begged "tokens" from ladies. And were presented with "favours" such as a veil, ribbon, or the detachable sleeve of a ladies dress. These 'favours' would be displayed by the Knight attached to his arm, his helm or tied to his lance. The lady thereby showed her favour to the knight who would dedicate his performance at the tournament to the lady. Some interesting facts and information about Elizabethan Tournaments. Elizabethan Tournaments were exciting and colorful pageants. Hundreds of Knights participated in this Elizabethan sport. Jousts, Melees, pageantry, Courtly Love and the Chivalric code all played a part in Elizabethan tournaments. Details, facts and information about other Elizabethan Entertainment and Elizabethan Sports can be accessed via the Elizabethan Era Sitemap.